A dance solo inspired by the poetry and life of the Czech poet Irma Geisslová. 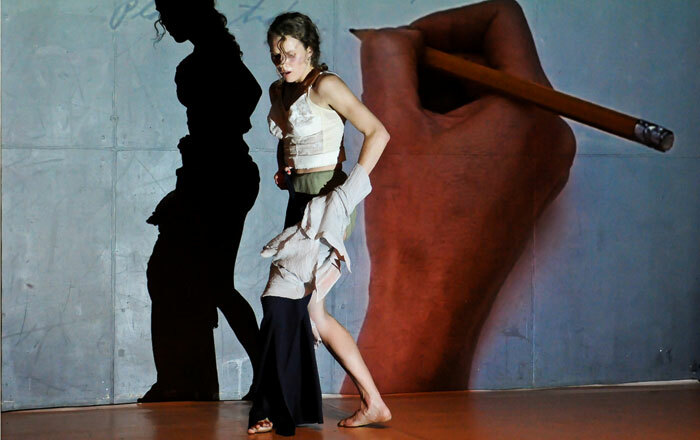 Through transformations of one woman using mute word, the voice of dance and videographology, this performance takes a moment to look for connections between women at the turn of different centuries. The new version of the production was created during the International Workshop of Coaching in Dramaturgy organised by SE.S.TA in Prague in 2012. Graduated from the Duncan Centre Dance Conservatory in Prague and continues her studies to this day within the projects of SE.S.TA. Since 2003 she is a member of the NIE international performance group. Apart from dancing and choreography she also teaches dance to children. As part of the Dance to Schools project she created the dance performance for children Fg=Gm1m2/r2. From 2005-2007 she taught movement for actors at the HINT High School in Norway. She was nominated for the Dancer of the Year Award 2012 (Margaretha Holds Forth).